We’ve hit “Peak EHR,” now what? 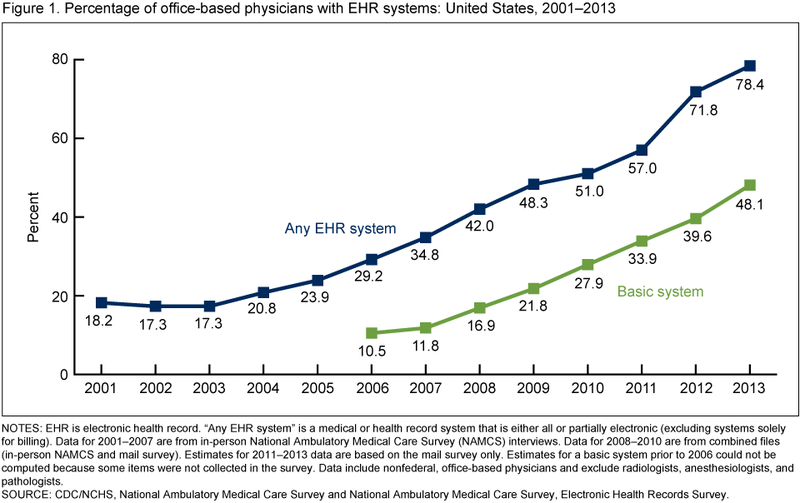 Home/Electronic Health Record Systems (EHR / EMR)/We’ve hit “Peak EHR,” now what? Today electronic health records are now entrenched in the care experience after a painful adoption cycle. In fact, the last ten years were the decade of EHR adoption, with penetration growing from 17% to nearly 80% over the period, according to the CDC. Affordable Care Act mandates drove this growth more recently (here in the States, anyway), and created an unintended effect: record systems were implemented with compliance in mind, not with workflow in mind. Now that EHRs are prolific, their workflow and integration shortcomings are coming to the forefront. All five tasks require data input or output from the EHR system, turning physicians into data entry clerks instead of care givers. With traditional back end integrations on hold, what do do? Florence Healthcare provides a technical approach that gives clinicians control over data access at the instant they need it. Our first solution helps them export data using a browser tool. The tool can grab data from nearly any database, and send it to that practitioner’s chosen integration. Applications include EHR export for clinical trials, medical record export to home care providers for transitional care, or reconciliation of medication lists. Learn more about Florence eBinders: Helping principal investigators and clinical research coordinators take back their day from paperwork. The last ten years were the decade of EHR adoption; we see the next ten years as the decade of EHR integration. At Florence we are building tools to help the clinical manage data at the instant it’s needed. Is medical record data entry and export driving you crazy? Tell us about it in the comments.